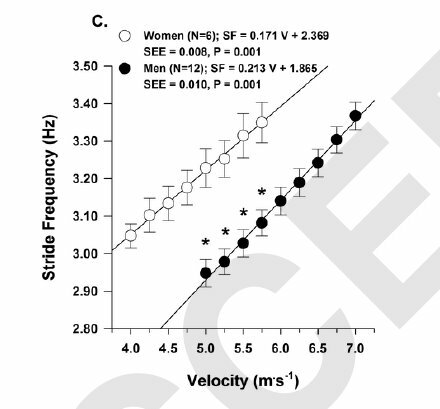 This is data from 18 elite runners (12 male, 6 female), showing their stride frequency as a function of speed. For reference, 3.00 Hz corresponds to 180 steps per minute; 3.3 Hz corresponds to about 200. On the speed axis, 4.0 m/s is 4:10 per km, and 7.0 m/s is 2:23 per km. In other words, these are FAST paces. The key point: they get faster, in part, by quickening their cadence. There’s no magic cadence that they stay at while lengthening their stride to accelerate. Interesting wrinkle: the women have faster cadence than the men at any given speed. Chapman assumes this is partly due to the fact that the men are taller — but even normalizing by height doesn’t quite erase the difference. (And that even ignores the argument that, as I blogged about here, cadence should be proportional to the square root of leg length, not leg length itself.) 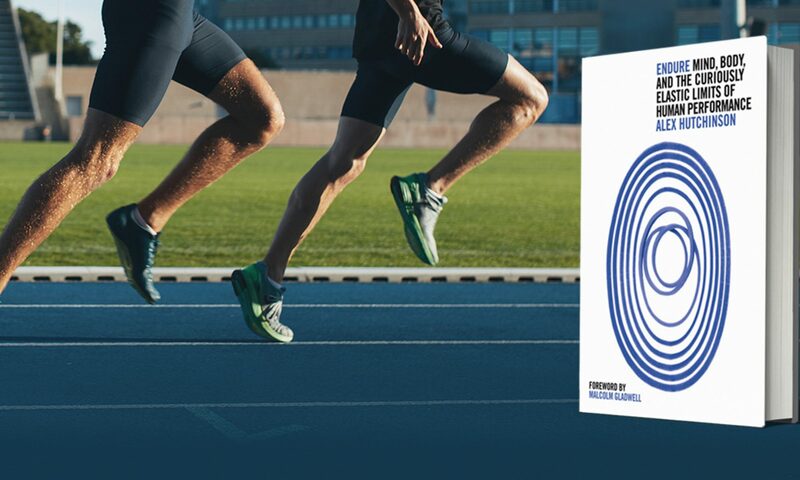 The remaining difference, Chapman hypothesizes, could be due to “application of greater ground forces by the men or differences in muscle fiber type distribution.” This makes sense: if you’re stronger (as the men, on average, will be), you’ll have stronger push-off, longer stride, and thus shorter cadence at any given speed. But it seems pretty clear that height plays at least some role. Is it the case, in general, that if you work on increasing your cadence you will run faster? Or do these faster runners just happen to have naturally higher stride frequencies? Is it even possible to increase stride frequency? Isn’t this obvious? If they have to run faster and they have already maxed out their stride length there going to need some other thing to change to increase their speed. @Sam: They haven’t maxed out their stride length — it’s increasing linearly throughout the whole range of paces (from ~1.30m at 4 m/s to over 2.00m at 7 m/s). Both cadence and stride length are crucial to changes of pace — you can’t ignore either of them. @Jeff: Personally, I’d disagree with the idea of specifically trying to increase cadence, unless you have a specific problem with overstriding (i.e. your foot lands far in front of your centre of mass). My belief is that what holds 99.9% of people back from running faster is lack of aerobic fitness, not that they’re moving their legs too slowly. If you want to run faster, the best approach is to train faster (i.e. do interval workouts where you run fast in short burts a few times a week) and run more (building up gradually). Do that, and (for most people) cadence and stride length will take care of themselves. One thing that often gets mixed up in the cadence debate is that the 180 number should never have been confused with an ideal cadence but simply should be viewed as an ideal Minimum cadence. In other words, if you’re striking less than 180 times per minute you will probably beneit from increasing cadence but if you’re going faster you definitely shouldn’t slow down. I have never seen an example where anyone running well — from elite down to Boston qualifiers — is going at less than 180/minute. Have you? For the faster female cadence (or shorter strides in other words), could there be any connection with pelvic structure and potential range of motion or at maybe effective force application through the range of motion? Actually, yes — that’s exactly what this blog entry shows, if you look at the graph posted about six inches above your comment: a group of elite male runners who slow their cadence to below 180 as soon as their pace slows below about 3:00/km. These are very fast runners (sub-4:00 milers, as fast as 3:36 for 1500m). But when they run slow, their cadence is below 180. Unless you’re running faster than 3:00/km, I don’t see any evidence that you should expect your cadence to be faster than 180. If these guys aren’t fast enough for you, take a look at video footage of Paul Tergat running with a 170 cadence and Usain Bolt running with a 161 cadence. The catch? They’re running a slower than race pace — in other words, they’re running at a pace similar to what most recreational runners run at. So if Paul Tergat has a cadence of 170 when running at 5:00/km, why should Joe Jogger aspire to a cadence of 180 when he’s running at the same pace? For me, you answered your own question. All of these runners, Tergat, Bolt and those on the table, can of course run at less than 180 cadences but only when when they are running sub-optimally for THEM. Obviously sub-optimal for Tergat is pretty damn good (read: unachievable) for me but that’s not the point. When Tergat is cruising, his cadence is much faster than 180. I have never seen any study that shows, for any level of runner, an optimal efficiency achieved at below a 180 cadence. Actual speed then will be based on ability and training and not cadence alone. But, my postulate is that when anyone is running most efficiently and fastest for that runner, the cadence will be equal to or higher than 180. The real point is that I think that the 180 cadence goal is good advice for the average runner and shouldn’t be dismissed so easily. I have found that when my cadence dips below 180 (through fatigiue or inattention) I can improve my running form and my perceived efficiency by consciously increasing the cadence to at least 180, and I think the science, even though there’s not much of it yet, seems to indicate that most other runners have the same result. Even the elites. @KG: I have no idea what you mean by “running sub-optimally.” Cadence depends on the speed you’re running. When Paul Tergat runs at 5:00/km, he’s running “optimally” at that pace — and his cadence is lower than 180. Do you mean than Paul Tergat wasn’t running “optimally” when he set the marathon world record? He was running at 3:00/km to set that record, but he’s capable of running much faster than that — for example, his 10K world record averaged about 2:39/km. To put it another way, when you head out the door for an ordinary run, do you sprint as fast as you can for the entire distance? Or are you running “sub-optimally”? While this is more sensible to me – that cadence will increase with faster paces – it reminded me of another article that contended that elites (during races, anyhow) stay steady, whether fresh at the beginning or struggling at the end. Would you care to weigh in? @Trevor: Thanks for question. Elites may stay at the same cadence during a race AS LONG AS THEY STAY AT THE SAME PACE. This is the most important message I’m trying to get across here: cadence varies with pace! That’s what the graph at the top of this post shows; it’s what every single study of cadence, whether among elite athletes or recreational runners, shows. The faster you go, the quicker your cadence — and, conversely, the slower your pace, the slower your cadence. Why is this important? Because — as the blog entry you linked acknowledges — the “rule of 180” was formulated based on Jack Daniels’ observations of ELITE RUNNERS DURING RACES. So it’s perfectly true that if you’re running at pace of ~3:30/km or faster, your cadence should probably be close to 180 or higher. But what does this tell us about the appropriate cadence at 5:00/km? Nothing! Even the super-duper “elite” runners who this rule is based on don’t have a cadence of 180 when they’re running at 5:00/km. Don’t believe me? Look again at the graph at the top of this page. Similar concept in cycling… cadence is a function of power. Seems like what some are missing here is the fact that many schools of thought, like Chi Running, say you should run at a given cadence (eg. 180) no matter what the pace – to speed up you then increase stride length only. But clearly this shows it’s not that simple, at least where elites are concerned. Speeding up my own cadence even at slower paces has helped quite a bit, if only in committing this to muscle memory to help increase it slightly further at higher paces. Coming VERY late to this discussion, but a simple observation of the graph shows that to achieve a certain speed the runners in the study increased BOTH stride length and cadence. And this is simple math: speed/frequency = stride length. Using the interpolation of the graph you get that stride length goes (non-linearly) from 1,47 mts/stride at 4 m/s to 1.90 mts/stride at 6 m/s. Simple math. And this my friends is why the champions of 100, 200, 400, and 800 meters are all 6′ 2 or taller. Taller people running with the same cadence as those shorter will be traveling faster because of their longer stride. They are BIGGER humans! Everything is proportional and it is so simple I cannot fathom how people do not understand it.